Front Row, left to right: Rhonda Rock-Assistant coach, Pattie Kamradt, Becki Warner, Jeni Buckman, Rhonda Runyon, Nici Hanlon, Denise Danley, Ben Wierzba-Mgr. 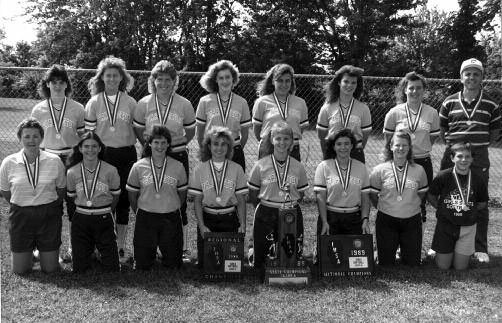 During the 1989 softball season the Farmington girls compiled a 28-3 overall record. With a first year coach, Tom Wierzba, and a freshmen pitcher, Becki Warner, they made Farmington's first ever school appearance in the softball state tournament in Pekin, IL. Farmington opened up the quarterfinals with Vienna and beat them 4-3, then on to the semifinals where they defeated Lemont 2-0, and on to the championship game where hey defeated the softball powerhouse Casey 2-1 for the Class A state title. 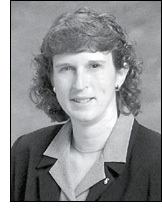 Becki Warner led the team through the tournament series giving up only 2 runs the whole state tournament series.